Although the majority of shrubs are sold containerized these days, roses are still often an exception. Many come in attractive prepacks, with little soil at their roots, and they need extra care when planting. The planting season for roses is from late autumn after leaf fall, on through winter during mild spells. All planting should be completed by early spring in the case of bare root plants. Container-grown roses can be set out almost any time, as with other shrubs. Take out planting holes and prepare as for large shrubs. Make the holes about 45 cm (18 in) wide and deep enough to accommodate the roots comfortably after bottoming out with well rotted manure or garden compost and planting mixture. Ensure that roses are always set out at the same depth as before the move. The soil mark should be visible on the stem. Soak the roots for a few hours in a bucket of clean water before planting. Trim back any which are very long, and cut back to healthy wood any which are broken, damaged or diseased. Spread out the roots and backfill as for large shrubs. With standard roses, the stakes should be in position before planting. Check that the top of the stake will end about 5 cm (2 in) below the bottom branch. After planting, tie near the top and again about half way down, using proprietary ties with spacers. Think in terms of taking out large planting holes of about 60 cm (24 in) square. 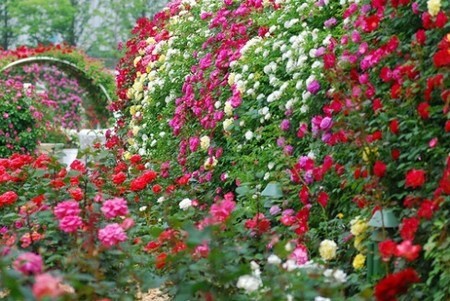 This is especially important if planting against a dwelling where conditions are often too dry for roses. The larger sized hole allows for more organic matter to be forked in rather than less. As with other climbers, ensure trellis is in place prior to planting. Position the rose with its stem to the back of the planting hole and roots spread nicely round to front. Backfill as before. Excavate pockets as deep as is practical. Bottom out with soil-based potting compost or planting mixture, using lime-free compost for lime haters. Pack more compost in and around the roots and, finally, cover over with chippings to prevent soil compaction and erosion. Use limestone chippings for lime lovers and granite for lime haters.